We've actually carried this hook model off and on over the years, but we've decided to bring it back online because it's such a popular choice with our excavation customers, mainly in sizes 8T and up. It is very much like the Crosby L-322AN Swivel Hook, only it comes at a much better price. Now we wouldn't try to push anyone away from Crosby, but for those that want a quality hook for a little lower price, this one is tough to beat. It's made from Grade 80 Alloy Steel and features a heavy-duty construction with a safety factor of 4:1. A heavy-duty safety latch comes pre-installed and replacement latches are available here. Made in Europe, this hooks carries with it the legendary quality you've come to expect from Pewag. It does swivel, however it is intended only for load positioning and is not designed to swivel under load. Also keep in mind these hooks are not intended for use with Grade 80 or Grade 100 chain slings. 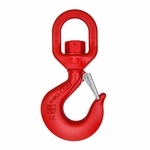 Good alternatives for chain sling swivel hooks would be the Crosby S-13326 Shur-Loc Swivel Hook, or perhaps the Gunnebo BKLK Swivel Bearing Hooks--both models rotate under load and have self-closing gates.